Keen-eyed bucket shoppers may have noticed the latest addition to the BuyBuckets range which went live on the website this week. We are pleased to announce our newest product category as screw top plastic jars. These new products are perfect for transporting, storing and displaying a range of different substances and products including creams, powders, tablets and foodstuffs. Our latest offering is a range of white, screw-top jars which will seal as tightly as you can screw them. These extra tough plastic containers are tamper resistant and food-safe, meaning that they can be used to store a range of sensitive substances. They come in a range of volumes (250, 500, 1000 and 1250ml) and lid diameters (70-115mm). They can be purchased for less than £0.40/unit. The screw top means that the lid can never come off accidentally, making this the perfect containers for things like face creams and tablets which could potentially make a mess or cause environmental damage, if released during transit. All of the plastic jars are fully opaque so your product will always be protected from sunlight. 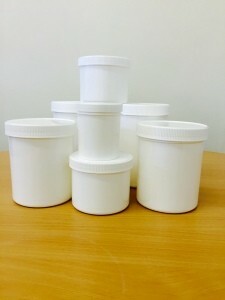 The sheer white colour also means that jars can easily be labelled with printed stickers or with black marker pens. These products were designed with some key products and customers in mind. Would these containers make running your business easier? We love it when our products make life simpler for business owners. Sometimes even we are astonished by the difference a simple plastic container can make to daily business life. If one of our products has made the difference for your business then be sure to let us know on Twitter. In the meantime browse our range of containers today and see how we can make your life easier.